Half the fun of doing a gas station taco blog is the hunt. I find out about places from people asking if I know such-and-such a place and searching Yelp and Google, but serendipity is still how I find most gas station taquerias. Driving back from San Antonio and spending a few hours in Fredericksburg, Texas before returning to Dallas over the Thanksgiving holiday, we drove highway 281 passing through a town called Marble Falls. My wife Stephanie noticed it first. 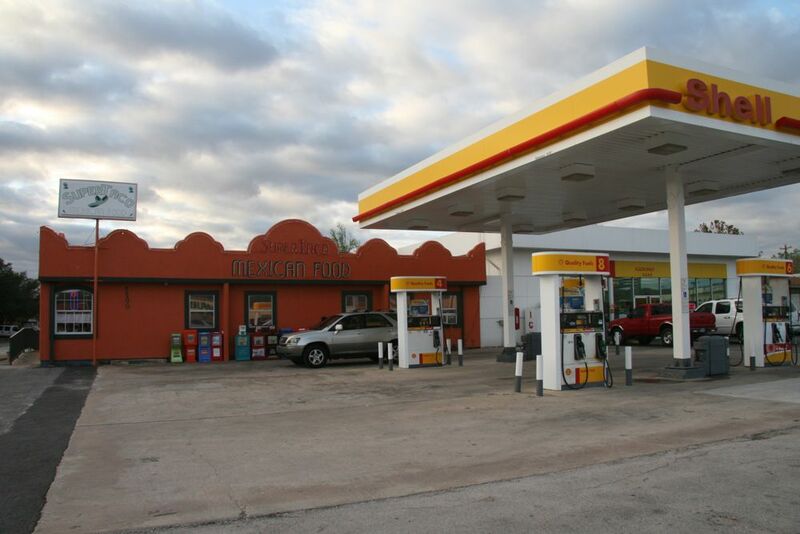 A large dark orange adobe building was attached to a Shell station. Unlike most gas station taquerias that are nestled into the back of the convenience store’s shopping area, this place has its own restaurant attached to the store. Walking in there are several tables, decorations and a small to-go window in back. There were several options for taco fans including beef and chicken fajita, barbacoa, carnitas, chicharrones (fried pork rinds), and several other choices. I wasn’t particularly hungry so I went with a beef fajita and something called Steak A La Mexicana. 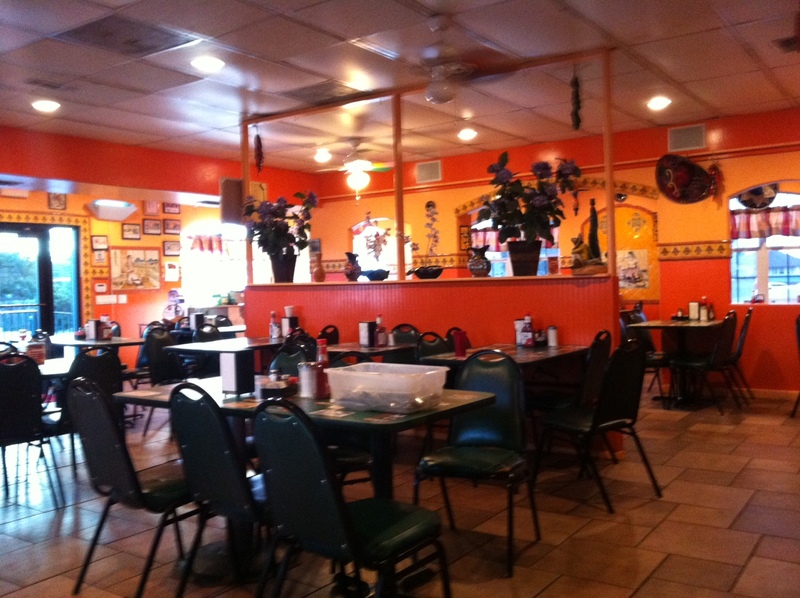 The menu also has a complete selection of other Mexican options if tacos are not your thing. 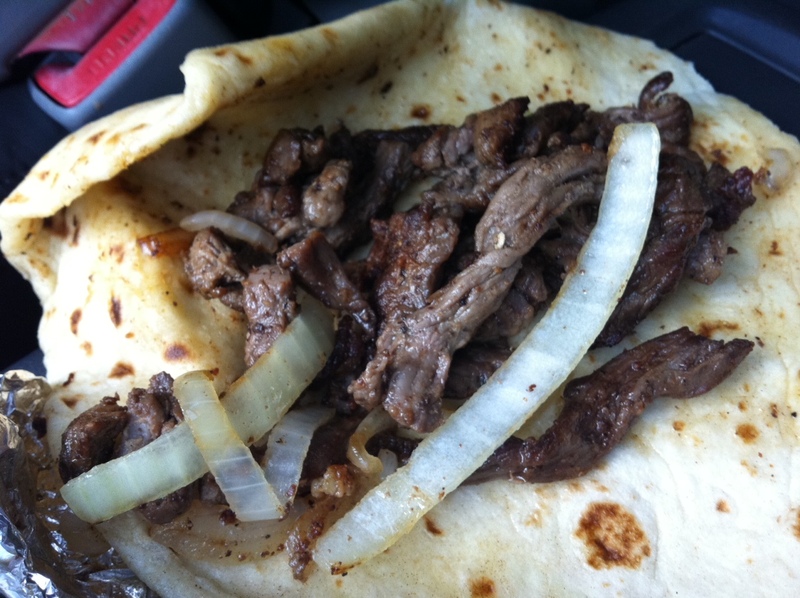 The Steak A La Mexicana is a flour tortilla filled with chunks of steak, onions, and green chili sauce. It was causing my brown paper takeout bag to leak a bit. The tacos are huge, more like a burrito than a street taco. The tortillas are homemade and are fantastic, definitely some of the best flour tortillas I’ve had anywhere. The beef fajita taco is excellent. There is plenty of flavor and large strips of beef filled the taco; though, it could’ve used some more grilled onions or a few peppers, but overall was one of the best spiced fajita tacos. The style though is more like ordering a fajita plate at a Mexican restaurant than the typical chopped street beef fajita taco most gas station taquerias serve. I wasn’t as impressed with the Steak A La Mexicana taco, but it is still a good taco, just a bit messy for a taco to go. I probably would’ve liked it better if I had dined in. The green chili sauce had a decent amount of spice. The taco would improve if it was chicken instead of steak, but that would require a renaming and reprinting all the menus. Overall Super Taco does live up to its name of making super tacos. If you like large, burrito-sized tacos full of flavor this is your place. Unfortunately, it is located in a remote small Texas town. My advice is if you are driving from Dallas to San Antonio (or vice-versa) take 281 instead of I35 order a couple tacos at Super Taco and avoid the Austin city traffic too. Should I start doing reviews about Tacos places? You think they would send me free ones in the mail to review? We have some great ones down here. I work home health and will treat myself once a week sometimes! Leo’s Mesquite Barbaque in the Exxon stations in Mission are good. Hope you enjoyed your trip and the holiday weekend!